"This app can't run on your PC." Status: offline When trying to install PS Pro 4.0 with Win10, the following message is received: This app can't run on your PC. The software is supposed to be Win10 compatible. Can anyone help? Status: offline This happened to a friend of mine. His computer didn't automatically identify which install file to run. The solution was to ‘extract’ the file to a folder. In that folder you will see a file for PrintShop4.0 x64 and another file for PrintShop4.0 x86. If you are running 64-bit Windows, then double-click the PrintShop4.0 x64 file. Your installation will start. Status: offline There is also something called "Windows 10 S" which is what Microsoft Surface tablets have. If you have one of these kinds of computers, you can't install any Windows app except those from the Microsoft store. You would only be able to install ours if you upgrade your Windows to Windows 10 Pro. Status: offline If you don't have a Windows Surface computer, do the following. 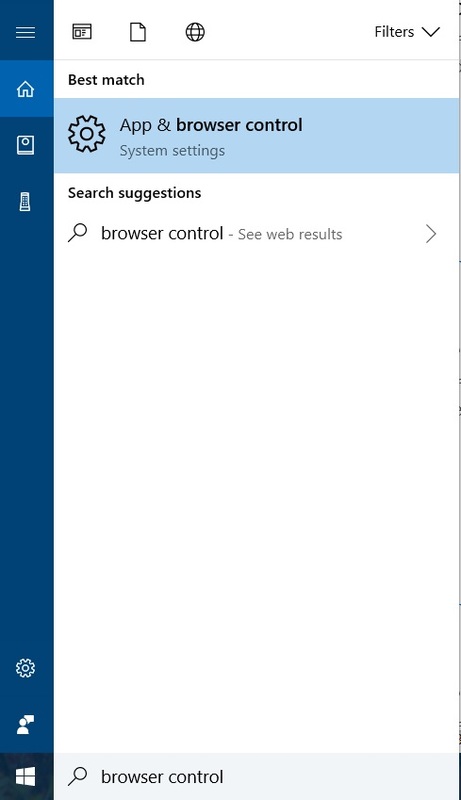 On Windows 10, type in Browser Control exactly like I have mine. If App and Browser Control does not appear when you type in browser control, try typing in different things related to app and browser control to get it to appear. Once you click on App and Browser Control, turn all three options to OFF and then reboot your computer. Then ,restart your computer and attempt to run the installer again. Status: offline How did he extract the program to a folder? Status: offline I emailed him. I had assumed he used an unzip program of some kind. I'll post as soon as he gets back to me. Status: offline Go ahead and send us an email if you already have not and I'll help you through Technical Support. and as said above, won't allow me to make my own half card sized envelopes. ... won't allow me to make my own half card sized envelopes. Start a new blank project, change the project type to Envelope, click the New button. Now it's ready to accept the dimensions of your new envelope. Status: offline Got an answer about extracting the file. You will need a better zip/extract program than WinZip which comes with Windows. WinRAR or 7-zip are examples. You can google for a free download. Status: offline Using 7-zip worked perfectly!! Thanks to you and your friend for I never heard anything from Encore. Status: offline Thanks for nothing!!! You have lost a loyal customer of many years!!!! That's great news. I hope the program is running well for you now. If you have questions about how to use any of the program features, I can probably help you here in this forum. I do a lot of desktop publishing. I'm not a computer tech person, but I'm glad I could help you with your tech issue. Sheer luck that the only other person who ever came across the "This app can't run on your PC" message was my friend who is a computer geek. Thanks for nothing!!! You have lost a loyal customer of many years!!!! The file is a compressed file so 7-ZIP Is a solution. However there is a solution to the issue which does not require 7-ZIP. I don't want to get too technical but the solution involves paying attention to the directory it extracts to before the error happens. So If you see the error happen, have the exact location of the folder open in a File Explorer Window. So have that Temp folder open and try to start the installer. When you get the error, press Alt - Tab to switch to the File Explorer window and go to the RAR folder in the Temp Folder. There is an X64 file that you can drag to the Documents or Downloads folder. Once you get back to the error message and press OK the error goes away. Simply double click on the EXE for the Print Shop that you dragged into the folder and you will be able to install as normal.